Panini published for the season 2016-17 a totally renovated collection of the Portuguese League. Futebol 2016-17 has a large size album, with plenty of special stickers for the three main clubs (Benfica, Porto and Sporting), a golden series with signed stickers of players in action (Serie Ouro), and a special section dedicated to the fresh European Champions, the National team of Cristiano Ronaldo & mates. The album has 444 stickers plus extra 40 update stickers (the series "Ampliaçao"). The album opens with the calendar of the season and the table of contents. The 18 teams of the Liga Nos 2016-17 are then shown in alphabetical order. Each team has 17 stickers over two pages: a metallic club badge and 16 players. 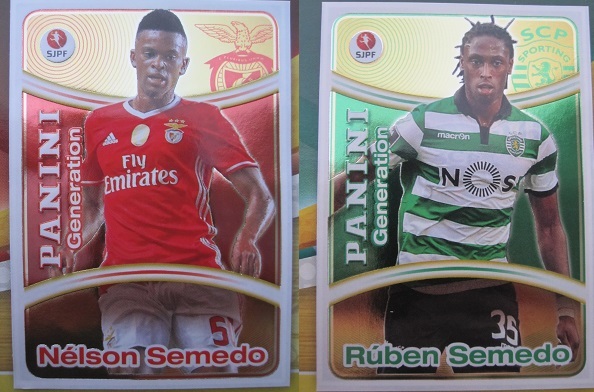 Benfica, Porto and Sporting have two additional pages with 16 stickers each: 6 players, the team photo (two stickers), and 8 metallic stickers (Panini Generation, Super Ataque, Idolo (two stickers), and four Top Aquisiçoes). In the middle of the album there are two pages with the Serie Ouro, a new feature of this collection. We can find 16 special stickers of players in action with autograph. The last part of the album is dedicated to the heroes of Portugal, capable of conquering Euro 2016 in France. 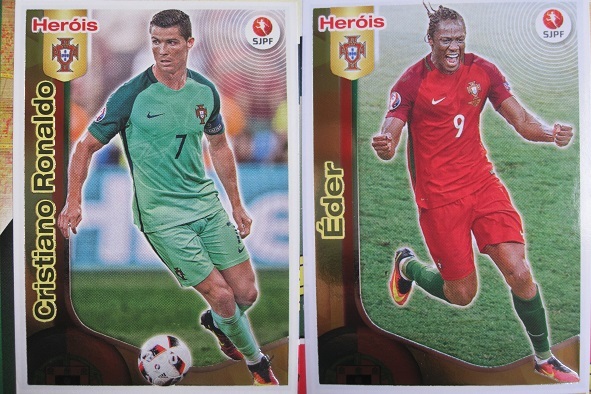 The first page of this section includes 8 action stickers about the matches played by Portugal at Euro 2016. Then there are 16 stickers of the most remarkable players of the National team and in the last page a big puzzle composed by 8 stickers of Portugal celebrating the title. There are 40 update stickers (Ampliaçao or so called Bis stickers) that can be found inside a new release of the sticker packs. Behind each sticker there is the name and number of the sticker that can be replaced. These update stickers can be either glued instead of the original sticker or kept separately. V. GUIMARÃES – PEDRO HENRIQUE 341 BIS; HERNÂNI 345 BIS.